We are land development professionals who provide superior quality environmental services including environmental site assessments, underground storage tank management, contamination testing, soil and groundwater sampling and testing, surface water sampling and testing, water quality evaluations, biological assessments, monitoring well installation, Brownfields assessment and redevelopment, wetland delineation and permitting. Our firm works closely with state and federal agencies to provide the most economical mitigation and remediation solutions. A Phase I Environmental Site Assessment (ESA) is a limited investigation of a property by a certified environmental professional to determine whether hazardous substances or petroleum products have been disposed or released on the property within the scope of the "Comprehensive Environmental Response, Compensation and Liability Act" (CERCLA). The certified environmental professional must perform "all appropriate inquiry" into the previous ownership and uses of the property. This practice is intended to permit a user to satisfy one of the requirements to qualify as a bona fide innocent purchaser with limitations on CERCLA liability. A Phase I ESA may determine there are "recognized environmental conditions" (REC's) of the property. However, no testing and sampling is included in a Phase I ESA. ASTM E1527 identifies the standard procedure for assessment of the environmental condition of commercial real estate. ASTM E2247 identifies the standard procedure for assessment of the environmental condition of forestland or rural property of 120 acres or greater. The primary objective of conducting a Phase III Environmental Site Assessment (ESA) is to prepare a corrective action plan and obtain approval of the proposed work plan from authorities having jurisdiction. A Phase III ESA typically includes a determination of anticipated quantities, analyses of alternatives and an engineer’s estimate of probable construction costs. A Phase IV Environmental Site Assessment (ESA) is prepared after completion of remediation (clean-up) activities on site. A brownfields site is any real property that is abandoned, idled or underutilized where environmental contamination, or perceived environmental contamination, hinders redevelopment. The hindrance comes from the fact that it is very difficult to obtain loans for redevelopment on these properties because they come with potential environmental cleanup liability. The North Carolina Brownfields Program, authorized by the state statute known as the Brownfields Property Reuse Act, provides a mechanism to treat prospective developers of brownfield sites differently than the parties responsible for contaminating them. Prospective developers negotiate a brownfields agreement with the program that defines activities needed to make the site suitable for reuse, rather than cleaning up the site to regulatory standards (which responsible parties are required to do). The environmental contaminants and associated risks must first be determined by environmental assessment activities, then a Brownfields Agreement can be negotiated. The Brownfields redevelopment process is a voluntary effort by a prospective developer to limit environmental liability in order to provide long-term productive reuse of a Brownfields property. Many different products are stored in underground storage tanks (UST’s) with the most common being petroleum products such as gasoline at convenience stores. A UST closure report is required by NCDENR-DWM for removal of a UST. The NCDENR Corrective Action Branch oversees the assessment and cleanup of sites where releases to the environment have occurred. A 2009 NCDENR report indicated that only 22% of UST closures were “clean” where no released product was detected. Some leaking underground storage tanks (LUST’s) may cause severe contamination where drinking water resources are adversely impacted and may require years of cleanup activities with significant costs. Other LUST sites may have impacted only surrounding soil with no groundwater contamination requiring minor remediation with insignificant cost. Monitoring wells are installed to allow sampling to obtain a representative ground water quality samples. Individual monitoring wells consist of a single casing in a borehole. A screen is installed at predetermined depth. Gravel/sand pack filter media is typically installed outside of the screen to aid in water migration into the well. 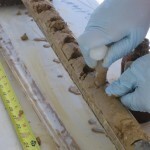 Water samples are obtained from within the casing and analyzed to determine ground water quality. Multiple screens may be installed at varying depths in a single well to form a multi-level monitoring well. Such wells may contribute to distribution of ground water contamination with the casing acting as a conduit. Clustered monitoring wells are installed in separate boreholes near the same location to obtain water quality data at varying depths. Temporary monitoring wells are typically installed in soils with higher hydraulic conductivities with short well screens using direct push technologies. Testing is performed by a EPA certified laboratory. The reporting requirements for petroleum products are in North Carolina's Oil Pollution Act. If the petroleum discharged, released or spilled is 25 gallons or more, or causes a sheen on nearby surface water, or is 100 feet or less from surface water body, then the person owning or having control over the petroleum must immediately take measures to collect and remove the discharge, and report the discharge to NCDENR within 24 hours of discharge, and begin to restore area affected by discharge. If the petroleum released or spilled is less than 25 gallons, does not cause a sheen on nearby surface water, and is more than 100 feet from surface water bodies then the person who owns or has control over the product must immediately take measures to collect and remove the discharge. If it cannot be cleaned up within 24 hours of the discharge or causes a sheen on nearby surface water, the person must immediately notify NCDENR. Soil samples are collected and tested to determine if a release has occurred and the levels of contamination present. Soil samples may be collected using a drill rig, push probe, or by hand from an excavated pit. Soil samples may be field screened using a Photoionization Detector (PID) meter to reduce the number of laboratory tests needed. Testing is performed by a EPA certified laboratory. A Storm Water Pollution Prevention Plan (SWPPP), sometimes referred to as an erosion control plan, should be developed for every construction project. Issuance of an erosion control permit requires compliance with National Pollutant Discharge Elimination System (NPDES). NPDES mandates monitoring and inspection of construction sites within 24 hours of every rainfall event and at least every 7 days. Inspection reports are produced to document compliance. The Endangered Species Act of 1973 provides a means to help preserve these species and their habitats for future generations. An “endangered” species is one that is in danger of extinction throughout all or a significant portion of its range. A “threatened” species is one that is likely to become endangered in the foreseeable future. The U.S. Fish and Wildlife Service’s Endangered Species Program oversees administration of protection of threatened and endangered species. In order to determine occurrence and potential occurrence of state and federally protected plant and animal species within a study area, a biological assessment is conducted. A biological assessment may include review of historical data sources, field investigations and preparation of a formal report. A biological assessment may conducted for a number of reasons. A biological assessment of stream quality may be conducted to determine potential impacts or mitigation required. A biological assessment of wildlife may be conducted to determine potential impacts to threatened or endangered species. Biological assessments may include review of historical data sources, field investigations and preparation of a formal report. "Asbestos" is the name given to a naturally occurring group of minerals composed of tiny, easily inhaled fibers. Because of its many useful characteristics, including fire and heat resistance, asbestos has been used over the past hundred years in the manufacture of some 3,000 different building materials. Common building materials include floor tile, linoleum or sheet vinyl, cement siding, roofing, pipe insulation, sprayed-on fireproofing, and decorative ceiling treatments. In many products, such as vinyl floor tile and siding, asbestos is combined with a binding material so that it is not readily released into the air. However, if the materials are sanded or crushed, asbestos-containing dust may become airborne and may be inhaled. The asbestos fibers may then enter the lungs where they tend to stay because of their shape. The asbestos fibers can cause lung cancer and other lung disease that may not appear until many years after exposure. An asbestos removal permit must be obtained from the NC DHHS/Division of Public Health, Health Hazards Control Unit (HHCU) if more than 35 cubic feet, 160 square feet, or 260 linear feet of regulated asbestos-containing material is to be removed from a building. Regulated asbestos-containing materials are materials containing asbestos that can be easily crumbled in your hand; that will be or have been subject to sanding, abrading, grinding or cutting; or that has a high probability of becoming crumbled, pulverized, or reduced to a powder by forces expected to act on the material in the course of the demolition or renovation. A notification of building demolition must be submitted to the HHCU, even if no asbestos is present in the building. Buildings must be thoroughly inspected by a NC accredited asbestos inspector prior to beginning any demolition or renovation activity. Lead can cause health problems for people when swallowed or inhaled. While potentially harmful to individuals of all ages, lead exposure is especially harmful to children under six years of age because it affects their developing brains and nervous systems. Permits for lead-based paint abatement for housing and child-occupied facilities built before 1978 are required from NC Department of Health and Human Services, Health Hazards Control Unit.